Thumb Arthritis - Joint Replacement Handout | Dr. Thomas Trumble, M.D. Thumb arthritis is a painful swelling at the base of the thumb that makes pinching and gripping difficult. There will be a gradual onset of swelling along with soreness while performing gripping and pinching activities. 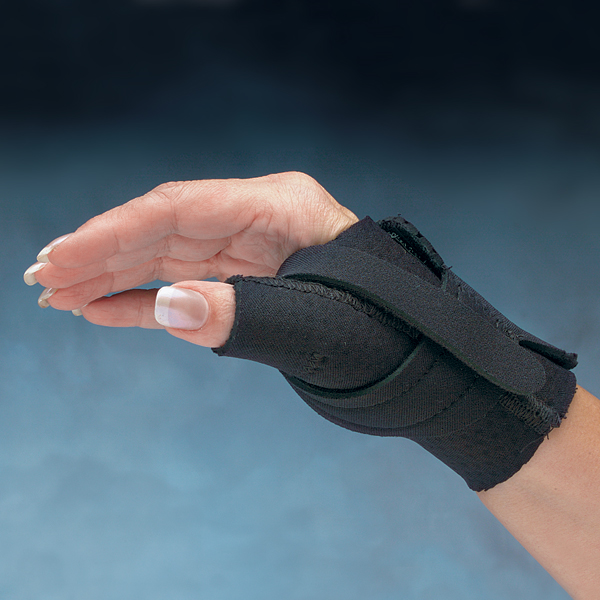 Occasionally, a grinding or crepitus can be heard as the thumb is brought through a range of motion. Thumb arthritis can occur in one of three main patterns (Figure 1). The most common is thumb arthritis between the thumb metacarpal and the trapezium. This occurs as noted on the left hand side of the figure. 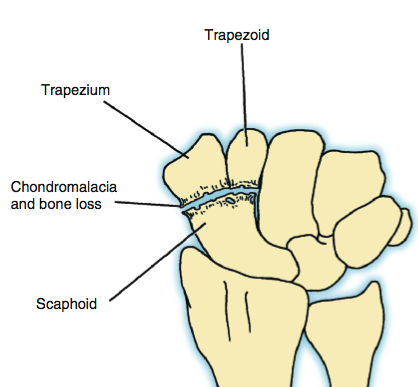 Arthritis between the trapezium and the scaphoid (middle aspect of the figure, middle diagram) is the least common. The second most common type of arthritis is arthritis that involves both surfaces of the trapezium figure on the right hand side. Thumb Arthritis is most common in women particularly in her 50s to 70s. This also can occur in men. Most patients do not have a history of prior trauma, although some patients have a relatively minor trauma as well as preexisting arthritis. After a simple fall, the pain and swelling of the thumb can be dramatically increased, despite the fact that x-rays demonstrate that arthritis has been present for many years. The diagnosis is made clinically with the pain, the swelling, and the grinding which occur as pressure is applied to the base of the thumb. Radiographs help to confirm the diagnosis and to differentiate between the patterns. In the early stages, bracing alone and nonsteroidal anti-inflammatory medications can be helpful (Figure 2). The patients who are having severe pain and difficulty that disturbs their sleep and can cause problems with everyday activities, often benefit from a steroid injection. This injection can cause substantial improvement in the symptoms. However, the day of the injection or the day after the injection, there can be increased pain and swelling and therefore it is recommended to take anti-inflammatory medications and apply ice to the thumb after the injection. This surgery can be extremely helpful in relieving pain and allowing the patients to return to their activities of daily living. The type of replacement performed depends on the type of arthritis. If they have the most common stage with arthritis that is limited to the carpometacarpal joint, a special type of joint replacement can be performed that maintains the height of the thumb using a Pyrocarbon implant. This implant is made out of pure graphite or carbon that is then heated to over 2000ºF (the same way that artifical gems are created). This provides a durable, smooth implant that is biologically compatible. If he/she has the advanced stage of the arthritis, the entire joint needs to be replaced. Research studies have demonstrated that reconstruction of the ligament and replacement of the joint provides the best mechanical stability. For the patients with isolated arthritis between the scaphoid, trapezium, and trapezoid (Figure 3), a biologic spacer can be used and placed after removal of the arthritic bone so to relieve the bone-on-bone pain. After the joint replacement surgery, the thumb, hand, and wrist are immobilized in a splint for 10 days. The sutures are then removed. Depending on the patient’s preference, either a splint or cast can be used for the next month, allowing soft tissues to heal. Six weeks after surgery, the patient can then have a brace that can be removed and worn as needed. The therapy is performed in order to regain motion, strength and decrease scar sensitivity. Although the patients typically regain most of their function at three months, it can take six to nine months before maximum recovery of function is obtained.